Pool Cleaning Service - Pool Repairs - Chlorine King Pool Service - Seminole, FL. HELLO & WELCOME to Chlorine King Pool Service! We can appreciate what a major decision it is to invite someone into your backyard to take care of your swimming pool. We are located in Seminole, Florida and provide the most honest and reliable pool cleaning service all around Pinellas County. We want to change the way your pool is serviced and the way you get to enjoy your pool. We can assure you once you choose us as your servicing company you'll see what you've been missing. You can also check out our Google website here for more information. We are available by email every day of the year and by phone Monday through Friday! We look forward to servicing your pool needs while making it safe and more enjoyable all year round! Our clients have access over the weekends and holidays as well. Chlorine King can create the perfect servicing package for you regardless of what your needs are. We have a slue of information we love to share from our clients. We want to be there for whenever you need us! You can find our podcast on the Apple iTunes Store here! 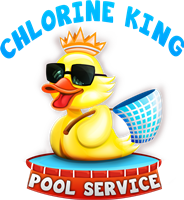 Chlorine King Pool Service will provide the most complete pool cleaning service in Pinellas County. Our primary goal is to keep your pool clean and safe so you spend more time in the pool and having the time of your life. There are so many pieces of the puzzle in keeping your pool clean. Chlorine King will be your solution that puts the puzzle together for you. Learn tips and tricks to help make your pool experience a very enjoyable one. Our customers make us tick. We realize that if we don't have happy customers, then we won't have customers. If we don't have customers, then we don't have a business. So quality pool service is our daily mission.